The last size (and still the most common today) is 1.44 MB. Was the limitation speed, storage density, cost, format standards, user demands, royalties, patents, rivalry, something else? 1.44 MB floppies actually had a maximum capacity of 2MB unformatted. Getting anywhere close to that was impractical because slack had to be left at the end of each track to account for variations in motor speed, etc. If you tried to pack too many sectors into a track you'd risk overwriting a first sector with its last one. The same goes for sectors within a track and spacing between tracks. By writing a complete track at a time using high-quality drives, higher densities could be achieved but this made the disk effectively read-only. This was sometimes used by e.g. commercial software to pack more bits onto each disk. Spinning the disks faster wasn't really an option due to the increased disk wear that would result coupled with the fact that the chips driving the drive couldn't keep up with the increased data rate (some systems streamed data to/from the floppy drive directly from the CPU). As technology improved, higher densities disks such as the 2.88 MB ones you mentioned were later developed but the cost-per-bit just wasn't there. By the time they came to market much larger and higher performance media such as Zip drives and CD-ROMs were being released. Despite being technically feasible they just couldn't compete. Increasing capacity to a couple of megabytes just wasn't worthwhile. By the time drives became good enough to reliably do it at low cost we were already well into the era of CD-ROM. Floppy disk's main advantage was that they were extremely cheap and widely compatible, and breaking that for the sake of a few hundred kilobytes just didn't make sense. Some did try, however. There was the "SuperDisk" format and the mildly popular LS-120 drive, which was a magneto-optical system. Zip disks were a similar form factor to floppies, and were also mildly popular for a time. But soon CD burners and eventually USB flash drives replaced them all at much lower cost and with near universal compatibility. Expanding on the cost issue, floppy drives are very simple and contain minimal electronics. They rely on a floppy drive controller in the computer itself to work. Almost all of those controllers didn't support higher densities so floppy drives with higher capacities usually had to use other interfaces, such as SCSI or IDE. That in turn meant that they were not well supported by the simple BIOS systems of the time and were usually not bootable. Again, CD and USB drives eventually gained BIOS boot capability due to being standardized and very common. There were not only many more, but also way relevant ones. Just think of the Apple II's 140 KiB format which at one point might have been the most used one. Or Commodore's 1541 with its 170 KiB format, for sure outselling many PCs of the same time frame. Or Apples 800 KiB format for the Mac - it took many years until the so called SuperDrive could also read 1.44s - mainly for data transfer reasons. The last size (and still the most common today) is 1.44mb. In fact, it may be useful to add machine type and region, as well as business area to qualify on what this claim is based, as for example in Japan the 2.88 drive is/was the most common one in PCs. Or take Apple's legacy-free iMacs, which was almost always sold with a SuperDisk able not only to do 1.44s, but also up to 31 MiB on standard floppies (and 120 or 240 MiB on dedicated diskettes). Similarly, certain business areas did see standard use higher density formats, like flopticals and Bernoulli (Zip) drives. Usually due to the fact that there was a great need for data exchange with large amount of data per item - most prominent here may be publishing. That's an incredible wide area putting atop a rather fuzzy definition (*1), so there may be many possible answers, so lets qualify it a bit and look at this in a greater detail. The firstmost might be to clarify about what defines as a floppy for this question. This category would contain all devices using magnetic recording on exchangeable rotating media. There may be subcategories as to include exchangeable drives or not. Here any media that allows data exchange between machines by being physically carried (and meant to do so). While this seams a bit wide and may even include punch cards, the addition of allowing random access would already nail it down to what floppies where for practical purpose in the 80s and 90s. After 2000, next to all development for floppy-like media dropped as CD-R and the upcoming DVD-R had taken over that niche. So even way before IBM adopted the 1.44 drive, floppies did reach not only higher densities, but also wide range use. And while the 1.44 HD format was often the basic drive, there were many differences even considering only 'simple' drives adhering to the 3,5" mechanics and compatibility with the HD format. Already before 1990 the 2.88 ED format became the standard in Japan and most parts of Asia. During the late 90s and into the 2000s LS120/240 drives became widely used all around the world - again with great focus in Asia but also Europe. And as de facto standard drive for iMacs after 1998. Unlike the 2.88and the LS drives, none of the later did gain any market hold. Similar in the non 3.5" HD compatible range of Syquest's removable disks and Iomega's Bernoulli/ZIP drives did gather a reasonable market share, but mostly as add on products (where 2.88 ans LS drives where also available as OEM choices). All of this development finally ended when CD-R (writable) - and especially their media - became available and cheap. Mind you, where even the cheapest LS120 or UHD144 was 5 USD (and a ZIP still 10 USD), a (one time writable) CD-R got sold for less than 1 USD in a 25 pack. The same way price did help the ZIP drives to succeed over the more compatible and reliable LS120/240 drives, it got killed by the even cheaper CD-R. After all, outside serious and repeated data transfer, no one really needs to rewrite a disk. If at all, a business case can be made. Small business (without the need for large chunk data exchange), here a FD was usually only needed for software installation. A rather rare task where handling of a dozen floppies was acceptable. While simple, incremental backup could be handled usually with compressed archives on floppies, only full backup might call for large removable media, but due the lack of any need for data exchange a wide variety of drives and standards have filled that nice. Ultimately CD and DVD writers have taken over the role for backup and data exchange - followed by an in-creep of network backup, formerly only found in large installations, due to the use of NAS systems. Home use. To some degree similar to the small business case. Again it was the advent of the CD in 1991 that replaced the floppy as main installation media (And let's be serious, which home user did care enough to back up their machines?) - and in this case even as main run media when it came to games. After all, the inherent copy protection of a CD (at least before writers became cheap) was a major push to publish games on CD and for home users to buy machines with CD drives. Like before CD/DVD writers have taken, followed by flash drives (USB-Sticks) over plus various kind of online storage. Again, not to forget, that flopticals (LS) and Bernoullies (ZIP) each sold many tens of millions of drives and quite a few companies (Dell, Compaq, Siemens, even IBM) offered such drives (usually LS) as standard setup with their machines. Not to mention the hundreds of millions of 2.88 drives sold in Japan and all over Asia. Why did common floppies never advance past 1.4mb in size? Beside the fact that they did and there were other, larger standard exchange medias, depending on region, machine and business? Bottom line, there was much development over all ranges in flexible magnetic media in 3.5" housings as well a with non flexible, non magnetic, non 3.5", or even non rotating when it came to removable exchangeable media. And most of it was driven by open standards and patents, or closed but still successful designs, either accepted by major industrial players like IBM, Microsoft or Compaq. *1 - Floppy is one of these seemingly simple and clear terms, that loses all definition when looking close.ly We all think we know what it is - until we go into details what is and what is not a floppy. Only 8" and 5.25", where media and case is 'floppy' or may either be 'hard'? Does the head have to touch the surface or may it fly? And so on. *2 - Even today this type stays without removable media - floppy drives are replaced by disabled drivers for storage over USB. Magnetic 'floppy' disk technology did get used in larger formats such as the IOMega zip drive. Floppies were obviously getting obsolescent by the back end of the 1980s but they got by as a 'good enough' default until CD-ROMs got cheap. CD-ROMs took over the role of installation media and by the mid 1990s most computers were networked so much of the requirement to shift files between machines was met by other tech. It turned out that most folks didn't actually have a requirement to transfer large files by sneaker net. Those folks that did used tech like Zip drives or removable hard disks but they were really a niche market item. By the back end of the 1990s recordable CD technology had hit the mass market, followed on in the 2000s by USB flash media. 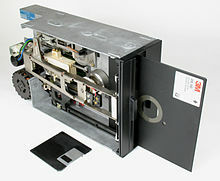 In addition to the speed, capacity and other issues when comparing floppy drives to newer media such as Zip drives, floppy drives suffered from a need for backward compatibility. Anyone who worked with the AT 1.2M 5-1/4" floppies with their intermittent, at best, ability to write 360K floppies compatible with the XT knows what I am talking about. I suspect that may be why with 3-1/2" the increases were a straight doubling - 720K -> 1.44M -> 2.88M and not some odd jump like 360K -> 1.2M. Nobody wanted a drive that looked like it should be compatible and could read older media but couldn't reliably write older media so that it could be read by other (older) machines. I suspect much higher density floppies are possible but not with full backward compatibility. Zip drives didn't have this problem - you knew when you got one that the only way you could use it on another system was to install a Zip drive there too. Back when floppies were used as a primary working medium, increasing the size of a floppy would allow one to perform more tasks without having to switch disks repeatedly. At the time 1.44MB disks were being developed, many machines either had no hard drives, or had hard drives that were small enough that people would still keep working documents on floppies. Going from a 720K drive to a 1.44MB drive thus offered a significant improvement in usability. Improvements beyond 1.44MB, however, would offer limited benefit in most cases even for people without CD-ROM drives. The only situations where someone would generally need to swap disks many times would be either when installing software, or when performing a large-scale backup to floppies. If a program just needs to be installed once, and will then be used a lot after that, there isn't really a huge difference between having to insert 10 disks once each or 20. Someone who's doing large-scale backups might benefit from using a 2.88MB drive instead of 1.44MB, but would benefit even more from using a tape drive. They did - by mutating into things like the Zip and LS120, which upgraded the actual media and carrier spec to allow better heads, much higher density coatings etc without losing reliability (though there was a side benefit in the LS120 case that it could use its improved heads and coding methods to reformat regular DSHDs to hold something like 10mb... reliability was apparently somewhat patchy, speed didn't improve enough to prevent writing the whole disk being a chore, and I think there were annoying limits such as only being able to write entire tracks rather than individual secors). 2.88MB was about the limit of what was achievable with traditional floppy disk technology, and even that was slow and unreliable despite demanding a fairly specialist coating formulation. The flimsiness of the media itself (still very floppy despite the hard outer shell) and the way the heads clamped around it in use just didn't make for an environment conducive to particularly high-density recording, or the higher rpms needed to read or write the full capacity in a reasonable length of time. The "superfloppies" introduced a degree of hard drive and/or optical drive technology whilst retaining the relatively thin and flexible base media (which kept the cartridges cheap, light, and paradoxically more durable as they would survive drops onto hard floors with less damage, bouncing instead of breaking), but had varying degrees of incompatibility with the previous generation. LS120 paid lip service to the idea but wasn't anywhere near as good a hybrid as it was sold as being. Zip gave up on the backwards compatibility idea entirely and focussed more on pushing itself as a mini-Bernoulli. Both providing a step change in affordable removable media capacity that was a bridge between floppy sizes and typical hard drives of the time (...in the early days of ownership, our family PC could be happily backed up onto just five or six Zips, and for a while I ran a Win3.1 frankenputer with an ATAPI Zip100 as an ersatz HDD). With that tech coming into play in the early-to-mid 90s, which is about the point where 2.88MB-or-greater traditional floppies might otherwise have started to gain traction, suddenly the market was whipped away from under them. 1.44s were retained for proper backwards compatibility and for all the various low-capacity storage and transfer jobs they'd always been perfectly good for, whilst superfloppies, and then CDRWs (and eventually, USB drives, once Win98 SE provided sufficient driver coverage and devices with a practical amount of storage - ie, at least 16MB - became affordable) stepped up to cover our higher capacity needs. I think it was inertia, and also a shame. 2.8MB floppy drives were a thing and were out there, from multiple vendors. The later IBM PS/2 machines used them, and so did some Unix workstations, but the 2.8MB format -- quad or extended density -- never really took off. Partly, it's because for many people, the major purpose was for software distribution. CD-ROMs became cheap enough and far more efficient for this, and for many people, non-writable, read-only media were enough: cf. the original Apple iMac. 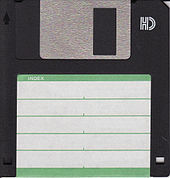 It did seem to me that if the floppy companies & PC makers had actually adopted them wholesale, the floppy disk as a medium might have survived for considerably longer. The 2.8MB drives never really took off widely, so the media remained expensive, ISTM -- and thus little software was distributed on the format, because few machines could read it. Then in 1994 came 100MB Zip disks, which for a while were a significant format -- I had Macs with built-in-as-standard Zip drives. Then the 3½" super floptical drives, the Imation SuperDisk in 1997, 144MB Caleb UHD144 in early 1998 and then 150MB Sony HiFD in late 1998. After that, writable CDs got cheap enough to catch on, and USB Flash media mostly has killed them off now. If the 2.8 had taken off, and maybe even intermediate ~6MB and ~12MB formats -- was that feasible? -- before the 20MB ones, well, with widespread adoption, there wouldn't have been an opening for the Zip drive, and the floppy drive might have remained a significant and important medium for another decade. I didn't realise that the Zip drive eventually got a 750MB version, presumably competing with Iomega's own 1GB Jaz drive. If floppy drives had got into that territory, could they have even fended off CDs? Rewritable CDs always were a pain. They were a one-shot medium and thus inconvenient and expensive -- write on one machine, use a few times at best, then throw away. I liked floppies. I enjoy playing with my ancient Sinclair computers, but loading from tape cassette is just a step too far. I remember the speed and convenience when I got my first Spectrum disk drive, and I miss it. Instant loading from an SD drive just isn't the same. I don't use them on PCs any more -- I don't have a machine with a floppy drive in this country -- but for 8-bits, two drives with a meg or so of storage was plenty. I used them long after most people, if only for updating BIOSes and so on. Not the answer you're looking for? Browse other questions tagged hardware history floppy-disk or ask your own question.